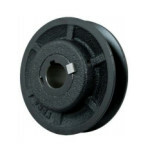 V-belt pulleys, also called sheaves, are used for transmitting power when used in conjunction with v-belts. 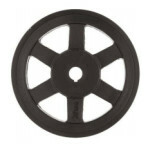 Beardslee stocks a large variety of V-Belt pulleys to help keep you in motion. Compact, narrow-wedge V Drives, which are available in 3V, 5V, & 8V belt sections, provide improved performance and permit high speeds. Classical V-Belt Drives are available in a wide range of sizes in A, B, C, or D belt sections. These classical sheaves are available with the convenient QD type bushing. Easy to install and remove, these split, tapered bushings grip the shaft with the equivalent of a shrink fit. Light duty, FHP V-Belt Drives offer capacities up to 15 HP and are available in two sections: “A” sheaves accommodate A (4L) belts, while “B” sheaves are made for A (4L) or B (5L) belts. 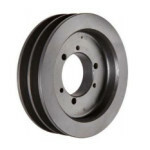 These are perfect when you need an economical, efficient, and lightweight sheave. The one and two groove adjustable sheaves are designed for 3L, 4L (A), 5L (B) or 5V V-Belts. The datum diameter of the sheaves is adjusted by loosening the setscrews in the hubs and turning the threaded flange to the desired setting and then the setscrews are retightened. These sheaves will give 30% change in datum diameter.